Accurate, reliable sampling and proper analysis are the two basic requirement of any industry to take remedial action for pollution free effluent discharge system. In spite of having very accurate and costly equipment and well-trained staff for analysis, many industries fail to restrict the level of pollution in effluent to the required standard due to high level of errors and limitation of manual sampling. 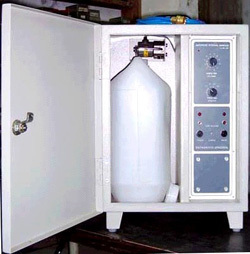 Looking into the general needs of various industries INSTRUMENTS UNIVERSAL has developed AUTOMATIC INTERVAL SAMPLER in year 1980, an import substitute for reliable and accurate sampling of effluents. Automatic Interval Samplers are designed to sample the effluent of required volume at required interval, by using these samplers; sample collection becomes easy,accurate and reliable avoiding manual errors. 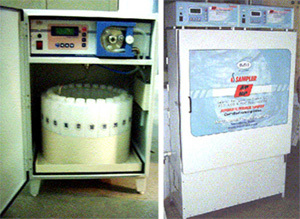 Since then we are leading manufacturer of Automatic Interval samplers in India for effluents sampling. We have supplied more than 900 units of various models through out country and abroad. We are an OEM supplier to some reputed effluent treatment consultants. We have supplied samplers in various industries like chemicals, Petrochemicals, Mining, Ore, Pulp & Paper, Textiles, Research Institute, Environment consultant, Sewerage and Effluent treatment plants. We would also like to request you to refer our special site for Street light controller for Energy conservation and automation in street, plant and compound lighting.